Preheat oven to 150°C (300°F). Place the sugar and water in a saucepan over high heat and stir until the sugar is dissolved. Bring to the boil and cook for 10–12 minutes or until the mixture is dark golden. Pour into a 20cm-round cake tin. Set aside for 5 minutes or until the caramel is set. Place the milk, cream, coffee and liqueur in a saucepan over medium heat until it just comes to the boil. Remove from heat. Place the eggs, extra yolks, extra sugar and vanilla in a bowl and whisk until well combined. Gradually add the milk mixture, whisking to combine. Strain the mixture and pour into the tin . Place the tin in a water bath+. Bake for 40 minutes or until set. Remove from the dish and refrigerate for 4 hours or until cold. Turn out onto a plate to serve. Serves 8. + Make a water bath by placing dishes in a baking dish lined with a folded tea towel and pour in enough boiling water to come halfway up the sides of the dishes. 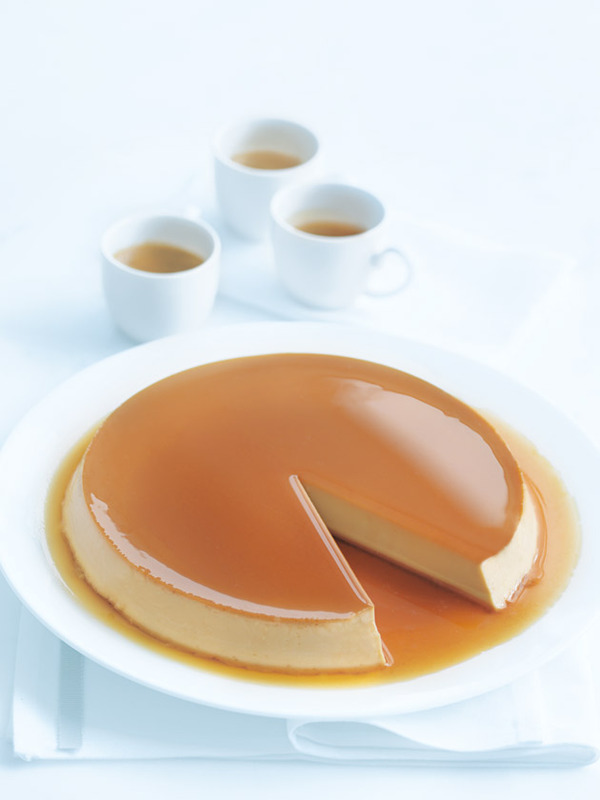 A folded tea towel in the base of the baking dish stops the dishes from sliding around and ensures the crème caramel cooks evenly as the dishes don’t touch the baking dish directly. What a gorgeous dessert. Perfect to share with girlfriends.